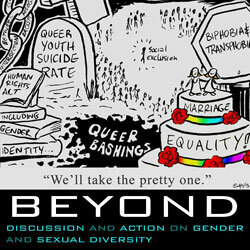 Audio from the session: Fighting homophobia, transphobia and bigotry in our communities. Social transformation means transformation of our own communities; our workplaces, schools, homes. This includes challenging everyday bigotry such as homophobia, transphobia, racism, sexism. A discussion of strategy and tactics in challenging everyday bigotry and oppression.